Picture the Scottish Highlands as you piece this 40" x 56" quilt—one of the newest in the Six Halves Make a Whole series. Just add a background and borders. A little "art" is included on the back so you use all of the half-yard cuts. 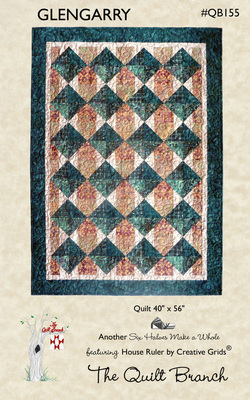 Using the House or Cottage Ruler by Creative Grids­® makes cutting this quilt quick, easy and accurate. **NOTE: The Cottage Ruler is no longer produced, but the House Ruler does everything the Cottage Ruler did and more.